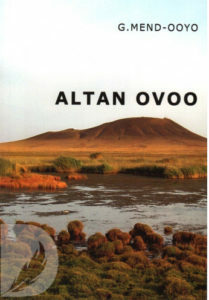 The latest addition to my website is Gombojav Mend-Ooyo‘s Altan Ovoo (Golden Hill). Mend-Ooyo is best-known in Mongolia as a poet but has also written prose works, including this novel which, unusually has been translated into English (by Simon Wickham-Smith). It is very much a poetical novel and tells of how his father took him to the sacred mountain of Golden Hill, when he was a boy. Golden Hill is important because it is sacred to his people but also it is associated with Genghis Khan (who is revered and not reviled in Mongolia) who may have died near there, after falling off his horse. We also learn of his travels around Mongolia, of his life, of stories of several Mongolian characters and several Mongolian animals and of various Mongolian legends, including their origin legend. It is a joy to read but, sadly, despite being translated into English, very difficult to obtain, as it was self-published in Ulaanbaatar.